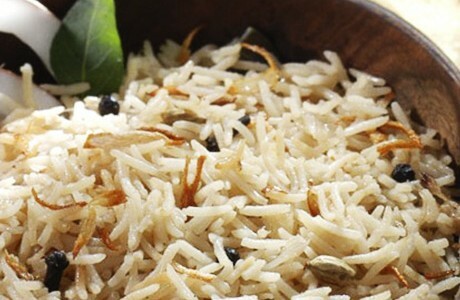 This sweet rice is enriched with the delicate flavour of coconut which pairs perfectly with fluffy, basmati rice. Black peppercorns, curry leaves, cloves and green cardamoms give a delicious depth of flavour to this dish, which is perfect paired with a hot raita or any lentil dish. Heat the ghee / oil in a wok; add the onions, black peppercorns, curry leaves, green cardamoms, and cloves. Sauté together until the onions turn golden brown.